Tile and grout cleaning in the shower is one of those tasks that everyone hates to tackle. It’s difficult and time-consuming and a huge amount of elbow grease is needed to get even mediocre results. The key thing is not only to get the area looking sparkling clean but also to ensure that you don’t damage any of the surfaces. The shelves of any supermarket or hardware shop are stacked with a myriad of products that claim to be able to make the job easy and ensure that you get a superior clean. The thing is, with these products, they can make any claim that they like without any proof that what they are saying is true. Finding the right product is the first step you then need to apply it to your shower. Some of the chemicals that are available can be very toxic so make sure that you follow the safety instructions. They usually require a great deal of scrubbing to get even the most ordinary results so be prepared to spend a few hours to get the results that you require. Bleach and water: Mop the area first with the solution then scrub with a dry cloth. Hard and for a long time. Baking soda and water: Mix into a thick paste and spread it onto the grout. Spray with household vinegar and then scrub with a brush. Baking soda and bleach: Mix into a thick paste and spread it onto the tile grout lines. Wait 5-10 minutes and scrub the mixture thoroughly into the grout then wipe with a damp cloth. These are just a few of the natural options for tile and grout cleaning. The thing that you need to be careful of is damaging either the tiles or grout or both. Remember that any abrasive substance can potentially cause harm so be careful of bleach and hydrogen peroxide in particular. Potential harm depends on the substance, the strength that you use and the age and type of tiles and grout in the shower that you are cleaning. The easy answer when you have a tough grout cleaning job is to call in the experts. They have the expertise and the product knowledge to know what will work best in your shower without damage. 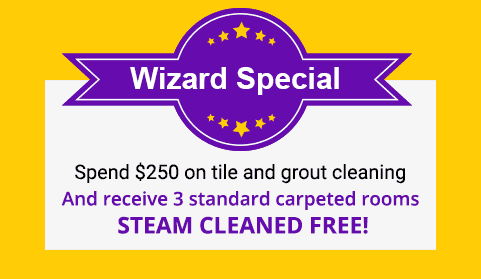 At Wizard Cleaning we use a pre-cleaning solution that helps to remove the dirt off both the grout and the tiles when we use our special cleaning tool. Contact us to find out how we can help you with tile or grout cleaning.